If you are just getting started in the trading world these are two basics, yet, effective patterns you must know. I´m hoping you understand the basic terms about chart reading, so before continuing, in case you are not familiar with the term reversal and other terms related you might want to read “Basics of Technical Analysis for Beginners”. Support and Resistance are literally horizontal lines — trend lines, drawn above or below price reversal patterns. When Prices are declining, supportrepresents the moment of the price reversal when buying overpowers selling. On the other hand, when prices are moving higher, resistance is the point where selling overpowers buying, and the price increase stops. These are not just reversals, but rather patterns or tendencies of a stock (crypto, security, etc.) in the past, whether it´s in an intraday, one week, one month or years. For example, Leila is a day trader, and she decides to exam the chart patterns of Costco to see how this market has behaved in the past and to decide when or if to long position herself. She notices that the price of Costco´s shares topped at 100$ consistently but wouldn’t go much over that, that is what we call resistance level. She also noticed that the price has not fallen under 50$ even though it came close to that many times, that is what we call support level. Based on the patterns Leila realized that it would be safe for her to enter the market at 41$ and sell somewhere around 100$. If you think about it, Support and Resistance are very self-explanatory. The market resists like a ceiling when prices reach a certain level upwards, and supports prices like a floor at certain low levels not allowing it to go under any further. These patterns are the most discussed patterns used to assist traders when to potentially enter and exit a trade, whether longor short. Of course, this is not an absolute science and the market can change and form new patterns, but most trades are based on the belief the pattern will not be broken. Oftentimes along with the topic of Support and Resistance, long position and short position are mentioned, though it seems like it has to do with the timing of a trade (long and short), the terms actually have nothing to do with it. Do not ask me why in the world these terms were chosen, I don’t know either (lol). Long position means buying a stock (securities, cryptos, etc.) with the expectation that the price will increase, you enter the market or open a position when prices are low to sell or close when prices are high (buy to open, sell to close). And short position requires borrowing stocks from a broker, through a margin account; the trader sells the borrowed stocks to open a position in the market expecting it to go downward, just to buy it back when it does (sell to open, buy to close). For example, the trader sells a stock for 10$ during a downtrend expecting the market to go even lower, let´s say it goes down to 8$, the trader buys it back and still makes money; and this is how it is possible to make money even when the market is on a downtrend. 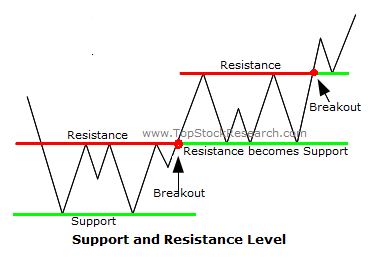 There are several ways to use Support and Resistance, but we hope this has been simple enough to get you going, we wish you the best of tradings. JOIN OUR COMMUNITIES: FACEBOOK, TWITTER, YOUTUBE,TELEGRAMAND MEDIUM.